It's like a special consumer-tech corollary of Murphy's law: Your PC will inevitably die just before a new Windows OS is about to ship. You need a new laptop immediately, and you can't wait to buy one that comes with the new OS preinstalled. Or maybe you want to upgrade a component or two to ensure that your system will be compatible with the new operating system. In either case, if you're planning on adopting a new OS, you'll want to get the most out of any new hardware you buy, even if you buy that hardware prior to the operating system's release. Microsoft has emphasized that systems capable of running Windows 7 can also run Windows 8. That may be true—but if you need to get new hardware, you should ensure that it not only "works" with Windows 8, but performs optimally with Microsoft's new baby. In this guide, I'll walk you through several purchasing scenarios, discussing which component upgrades to make in anticipation of Windows 8, and what to look for when buying a new computer that currently runs Windows 7. If you need to buy a new system now, you'll want it to be primed to offer a no-excuses Windows 8 experience down the line. If you're running Windows 7, installing Windows 8 should effortless, right? Maybe, maybe not. Some individual applications may not be compatible, particularly if they require low-level access to the operating system—as, for example, antivirus packages do. Similarly, some hardware drivers may be incompatible, though Windows 8 setup will usually (but not always) replace those with supported drivers. In particular, you'll want to identify Windows 8 drivers for your networking hardware. I've seen Windows 8 install on a system without any visible drama, only to discover that it had failed to install a networking driver. So it's best to have all of your key drivers on a USB memory stick, ready to go if you need them. Most manufacturers have already begun putting up Windows 8 drivers, so you should start poking around in their online support pages. Another issue is your system BIOS. Windows 8 requires a feature called data execution prevention (DEP). DEP prevents certain types of misbehaving code from running. Specifically, it prevents code running from within sections of memory marked as data pages. Such code can originate from badly written applications, but more often it's a sign of malware. Windows 8 needs to have DEP enabled in the BIOS, and some older systems may have a BIOS that lacks DEP support, in which case you may need a BIOS update to enable it. Socket 478 Pentium 4 and earlier systems may not have the capability at all—in which case, Windows 8 won't run, even if it installs without complaint. Even if your BIOS is up to snuff, you may run into hardware or software incompatibilities. Windows 8 is supposed to work with any hardware that runs on Windows 7, but older hardware may still be problematic. And software that requires driver-level access may have issues, too. The easiest way to check out compatibility issues is to run Windows 8 setup. You can download the Windows 8 release preview, create a DVD (or install it to a USB flash memory key) and run Setup, making sure to answer 'yes' when the setup program asks you to download the latest version of setup. Note that you don't have to install Windows 8; the nice thing about the installation routine is that it first performs a compatibility check. Windows 8 Setup has a built-in compatibility checker. In the screenshot above, the reported problem with the networking hardware spells trouble. I would definitely want to have a Windows 8 driver on hand before proceeding. You need a new graphics card. Or the 19-inch, 1280-by-1024-pixel LCD panel you've been using for years is finally starting to fade. Or you're contemplating buying something as simple as a new mouse. If you need to upgrade any piece of hardware, take time to research what will work best with Windows 8. Even if you don't plan on upgrading immediately, new hardware tends to offer better features, performance, or both. Let's look at a couple of examples. Suppose that you have an older graphics card—say, an Nvidia GeForce GTX 260 or an AMD Radeon HD 4850. Neither runs current-generation games especially well, and both make more noise and consume more power than modern graphics cards. Currently, you can find tempting sale prices for one-generation-old GPUs such as Nvidia's GeForce GTX 460 or AMD's Radeon HD 6850. But if you're thinking of moving to Windows 8, it may make sense to consider a current-generation graphics card, such as the AMD Radeon HD 7970 or the Nvidia GeForce GTX 660 Ti. Both of those models support DirectX 11.1, which Windows 8 also supports. Evga's GTX 660 Ti supports DirectX 11.1. Admittedly, DX11.1 offers only incremental upgrades from DirectX 11. But many of those features promise greater efficiencies in the Direct3D pipeline (bigger constant buffers, for example). DirectX 11.1 also adds stereoscopic 3D support. For Windows 8, the key feature that DirectX 11.1 brings to the table is better 2D performance through Direct2D, which means that windows pop onto the screen more fluidly, and overall text rendering is much snappier. Windows 8 supports touch and gesture recognition in a big way. Nevertheless, though you may be tempted to upgrade to a multitouch desktop display, only a handful of models are available on the market today—and the ones that do exist are either quite expensive or painfully small. But some nifty touch-enabled interface devices are available (or are coming very soon), and they have the potential to work more effectively with Windows 8. For example, Microsoft has released its Touch Mouse, which works like a normal mouse, but has a touch-sensitive surface that will support Windows 8 multitouch gestures. The Wedge Touch Mouse is similarly touch-sensitive, but it's tiny and portable. Since the Wedge Touch works with Bluetooth, it is ready for the coming generation of Windows 8 tablets. 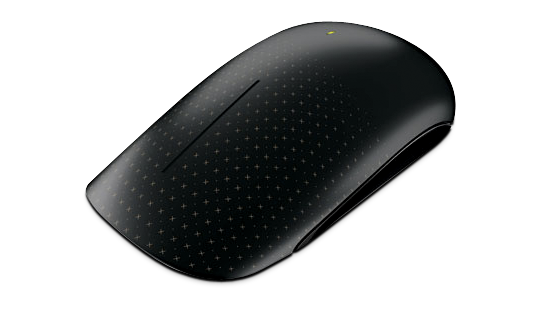 Microsoft's Touch Mouse will support Windows 8 gesture recognition. Logitech's 5-inch wireless touchpad fully supports multitouch gestures, and should work with Windows 8 gesture recognition. Large touch surfaces have the potential to emulate the way touch displays work, and can serve as a viable substitute. On the speculative side, I'd love to see a touch-enabled mousepad, but designers must overcome some obvious technical challenges first, such giving the mousepad the ability to detect when the user is wielding it as a mouse and when the user is employing multiple finger gestures. Your laptop died. Your desktop PC is on its last legs, as the tell-take grinding sound of the hard drive indicates. How do you proceed if you have no alternative but to buy a new PC today? The relevant considerations differ, depending on whether you need a laptop or a desktop. Few laptops today ship with touch-enabled displays, and there's no guarantee that a convertible tablet-style PC designed for Windows 7 touch will have full ten-point multitouch. Indeed, most of the touch-enabled laptops from the Windows 7 era offer only two-point multitouch. But when Windows 8 launches in October, we'll see a large number of laptops with built-in ten-point multitouch, ranging from traditional clamshell laptops to convertible-style units with detachable displays that can function independently as tablets. If you need a laptop right now, try to track down a system that has a trackpad with both ten-point touch and edge detection. A touchpad with edge detection is ready for Windows 8. Swiping in will bring up the charms bar, for example. Two systems that are already shipping today with ten-point touch and edge detection are the Asus Zenbook Prime UX31A and the Vizio CT14-A2. The trackpad on the Asus Zenbook Prime UX31a supports edge detection. If you need to replace a traditional, high-performance tower PC, you don't need to be greatly concerned with its specific Windows 8 capability. You should, however, spec your new tower with a DirectX 11.1 GPU and possibly a mouse such as Microsoft's Touch Mouse. On the other hand, if you plan to pick up an all-in-one PC, various systems are already shipping with ten-point multitouch, including the Lenovo ThinkCentre A720. The Lenovo ThinkCentre A720 is ready for Windows 8. You may not feel inclined to upgrade to Windows 8. But even if that's true, as you plan for upgrades or for buying a new system, it's worthwhile to take steps to ensure a good Windows 8 experience. You may not want Windows 8 today, but eventually you may find a compelling Windows 8 app that draws you to the new OS. And when you resell the system or hand it down to your kids, they might want Windows 8. It makes sense to try to accommodate future possibilities when you buy today's hardware. You'll reduce the likelihood that you'll encounter a dead end or have to drop even more money for better compatibility in the near future; and in the long run, you'll save both time and money.